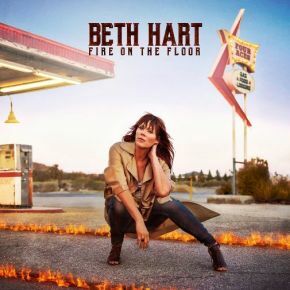 It is extremely difficult to pigeonhole Beth Hart’s music, particularly with her latest studio release Fire on the Floor. Not that it matters. Ultimately she is quite simply unique and probably the finest female vocalist out there today. This album as much as any other she has come up with underlines the fact. From the off, with the deliciously vibrant Jazz Man we know we are in for something special, her voice soaring to heights eagles would find dizzying but with all the control of a fighter pilot in full battle mode. The lyrics are compelling; an insight into Hart’s own psyche and passions, there is not a song here that has not been considered to the nth degree. Listen to the debut single, Love Is A Lie, and try not to get up and dance to its sultry, rhythmic seduction then listen to the smouldering quality of the album’s title track and try not to reach for the tissues. It is this emotional joy ride that Beth Hart is so masterful in creating. One moment she's full of sass and fun with a song as finely tuned as Coca Cola, the next she is all power ballad brilliance with Picture In A Frame. A song guaranteed to resonate with anybody who hears it on such a personal level and for so many reasons. Woman You’ve Been Dreaming Of is heartbreaking in its simple, chord-striking construction, whereas Fat Man is out-and-out fun, but with an edginess that exemplifies the skill Hart owns in creating “the new” time and time and time again. A song if ever there was one that is tailor made for the live arena when Beth Hart hits the UK road again in November. Fire on the Floor is, to coin a cliché, a veritable chocolate box of unprecedented pleasures; as close to being the perfect collection of everything that’s good about music with the added bonus of the very best in musicianship and production. Manchester Bridgewater Hall (21 Nov), and London Royal Festival Hall (23 Nov). Book Online: www.alt-tickets.co.uk/beth-hart-tickets. 24 HR Box Office: 0844 871 8819. Visit: www.bethhart.com.